A sparkling clean deck provides a much more enticing incentive to spend warm spring and summer days outdoors. Glendale Pressure Washing offers professional and affordable deck cleaning services to help you maintain the appearance and sanitary conditions of your home's deck, patio, or pool deck. We can assist you in eliminating any eyesores or cosmetic problems in order to restore the beauty of your exterior spaces. Contact us for efficient and effective power washing services to get back to enjoying your barbecues and sunbathing sessions on a spotlessly clean deck. Algae is a common problem for homes with an outdoor pool. The combination of stagnant water and ample sunshine allows algae to thrive both in the pool itself as well as surrounding surfaces such as pool decks where water can accumulate. Although proper precautions and preventative maintenance can greatly lessen the likelihood of algae growth, it can be a persistent and frustrating issue to deal with. Our power washing service will thoroughly get rid of any algae growing on your pool deck or deck for you so that you won't need to worry about unsightly green spots anymore. Whether the appearance of your deck has been marred by food and beverage spills from the many barbecues you have hosted over the years or has simply been dulled and discolored by the passage of time and exposure to the elements, our deck cleaning service offers you the perfect way to restore the look of your deck at an affordable cost. Our pressure washer can get rid of the layer of dirt and grime that detracts from the natural luster and beauty of the wood material that makes up your deck. Restoring the appearance of your deck does not need to involve costly and intrusive renovations or repairs. In many cases, pressure washing can make a dramatic impact on the way that your deck looks without having to pull out a single nail or replace a single plank of wood. 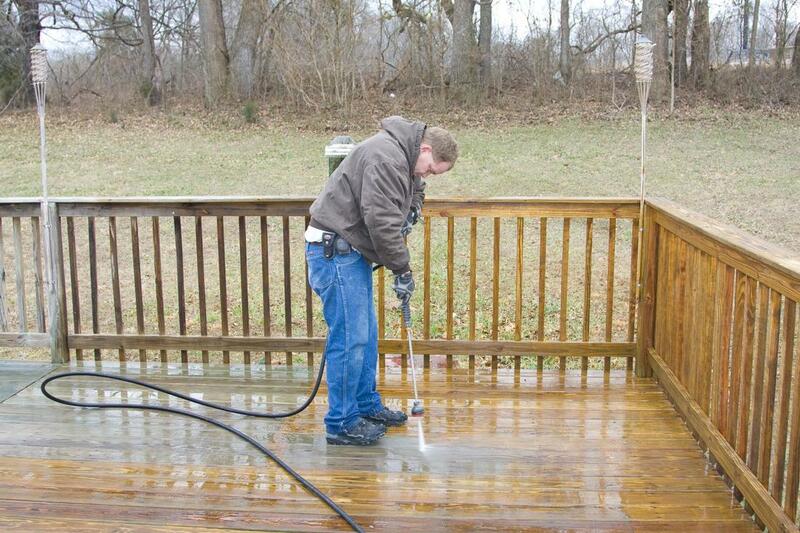 Our pressure washing service completely cleans any dirt or stains from the surface of your deck and provides you with a surface that is fully prepared for a fresh coat of paint or wood stain. A thorough cleaning and a few small touch-ups have the ability to transform and renew the appearance of your deck at minimal cost or inconvenience. Not only is our power washing method fast and efficient, it is also one of the safest and most effective ways to clean a multitude of exterior surfaces. From the siding of your house to the driveway, we use top of the line, commercial grade pressure cleaners to blast away dirt and grime that have accumulated on the surface of exterior areas of your home. Our knowledgeable team is able to consistently deliver the results you are looking for both in terms of aesthetics and sanitation whether you need assistance with deck cleaning or sidewalk spraying. We have the right tools and experience to get your property sparkling clean.